replied to How do you handle cycling withdrawal? replied to What's with the new boom box trend? Great interview! Really enjoyed Neil's tales from the trails. 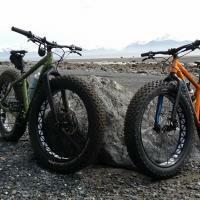 Happy Global Fat Bike Day! My favorite trails are Kincaid Park and Far North Bicentennial Park in Anchorage, AK. Very little grooming, trails get packed by fat bikers, skiers and hikers. Our trail systems double in size in winter. Swamps, lakes and bootleg trails become ride worthy. Thanks for sharing Greg. I am going to look into the sleeping pad. I have a shot lower back and can't handle more than 2 nights on my thermarest. A comfortable sleep pad could be the game changer for longer adventures. Routing for Alaskan Will Ross, good luck Will! Make noise constantly. Use bells or a Bluetooth speaker. Carry bear spray. Keep it accessible, not in your pack. I occasionally carry a Ruger 454, don't carry a gun if you don't practice and feel comfortable. The Snowshoe 2 XL makes sense if most of your riding is in fresh snow or consistently soft conditions. It also makes sense if you don't like changing out tires a lot. The lack of studs makes it questionable though. I ride studded Dillinger 5's all winter, covers all conditions. The best trail ever is the one your on. commented on Should I Buy a Low Spec Mountain Bike and Upgrade Later, or Go for the High End Build Now? replied to Fat biking year round?? ?